Experience a new way to mix and perform with TRAKTOR KONTROL S8 – a 4-channel stand-alone mixer, professional audio interface, and enhanced Stems-ready decks for ultimate control over the included TRAKTOR SCRATCH PRO software. Touch-sensitive controls and high-res displays deliver DJ workflow that is truly cutting-edge. Play different. TRAKTOR SCRATCH PRO's Effects, Remix Decks, and track browsing come to life on full color displays triggered by touch-sensitive controls. Two wide touch strips allow for pitch bending, track seeking, and vinyl scratch emulation. Sixteen color-coded performance pads transform the decks into powerful live performance controls. Trigger Remix Set cells, slice up and rearrange in Freeze mode, tweak your loops, or improvise using hotcues - all within view, and within reach. Not the average mixing interface. TRAKTOR Mode buttons on every mixer channel toggle between TRAKTOR and stand-alone mode for integrating a wealth of analog and digital gear - perfect for use with TRAKTOR SCRATCH and seamless transitions between multiple setups. The S8's 4-channel mixer section features innovative wear-resistant faders. Under the hood, inversed carbon strips prevent nightclub wear from debris and drastically prolong fader life. Connect anything your setup needs - TRAKTOR KONTROL S8 boasts the most expansive connectivity on a DJ controller yet. 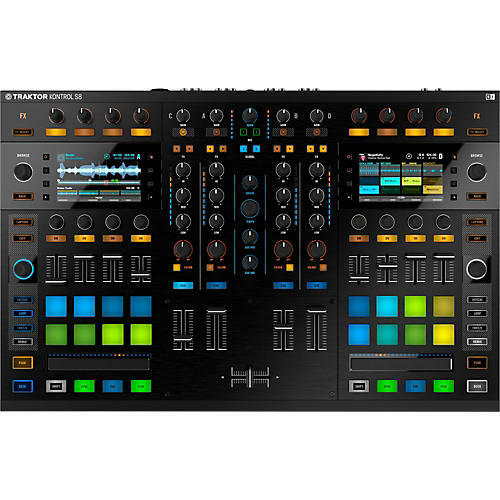 The on-board 4-channel mixer features unique wear-resistant faders that offer unprecedented durability. Plus, TRAKTOR Mode buttons on every mixer channel switch between TRAKTOR and stand-alone mode - ideal for handing the night over to the next DJ.